About ten years ago I was involved in a pastor's training conference. In one session, as we talked about discipling young believers, we tried to come up with a list of key biblical truths we would want to teach every new Christian. People gave the usual responses (and that's not a bad thing! ): we wanted to teach new Christians the importance of Jesus' death in our place; we wanted them to know about the Holy Spirit's work; we wanted them to understand sin; we wanted to teach them about the church. But then a woman who had been a missionary in Argentina for many years added her voice to the conversation. I will never forget her contribution: "We need to teach them to suffer." 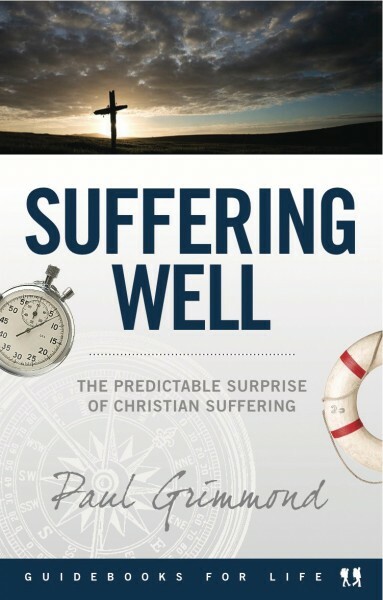 You can get yourself a copy of Suffering Well from Matthias Media. 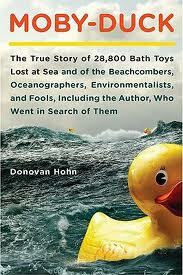 Available in paperback or as an eBook. While the world tells us that human beings are just another part of the food chain, God tells us that humanity is the centrepiece of his plan. By God's grace, we are precious to him. And throughout human history, God has worked towards the glorious future he has planned for us in spite of the sin that characterises us. When Adam and Eve sinned, they were expelled from the garden but not destroyed. When the world was wicked in the days of Noah, God chose to rescue humanity through Noah and his family. In the face of the tower of Babel, God promised Abraham that through his descendants, every nation would be blessed. And in spite of the repeated, unrepentant rebellion of Israel that caused them to be cast out of the Promised Land, God continued to promise a future to Israel and, through Israel, a future for the whole world. 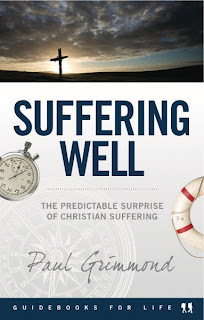 From Suffering Well by Paul Grimmond, page144. I found this very short talk (it's about four minutes so it really is short) from John Piper about aging and sanctification interesting and helpful. At one point he explained that getting older doesn't equal sanctification. Certain desires - he listed lust and greed for money but you could add all sorts of other things like grabbing for power, covetousness and so on - will likely lessen as a result of aging, sometimes for physiological reasons and sometimes because these things simply become redundant after a certain point in your life. But just because these desires lessen or even disappear, that doesn't make you holier. It is a deep seated, growing relationship with Jesus that makes you holy. So it is important not to be fooled into thinking that you are growing in holiness if the aging process is bringing some of these urges under control. They would be the hallmarks of growing in holiness but they don't represent holiness in and of themselves. It seems so obvious as I write it down - but it's good to have teased out the distinction, none the less. The benefit of aging, he said, is that "your resevoir of past grace is growing." Lovely. Your relationship with Jesus is all the more sure and strong because you can look back on an ever increasing collection of moments when you have seen God clearly at work in your life. That is very steadying. The unexpected surprise, he said, was that at age 30 he thought that in thirty years time he would be thirty years more kind and thirty years more patient. But certain sins have remained and that this isn't necessarily the case. Good to be mindful of this. The point of the book of Job is not to explain the reason for every episode of suffering in the lives of innocent people. It is to remind us that God has reasons beyond our reasons, and to call us to humbly rely on him. Job suffered deeply. But God taught him that he didn’t need all of his questions answered; he just needed to know the living God. From Suffering Well by Paul Grimmond, page38. Teaching kids about God photo by Cathy. Thanks Cathy!! Another thing I do to keep Scripture classes at school (30 minute lessons) and Sunday school classes (40 to 60 minutes) humming along is to use timed challenges throughout each lesson. I have a chart where I record everyone's best times and it is highly competitive. Here's THE WHAT...and then I will explain the HOW and the WHY. Pull out this old toy from the toddler toy box. Time how long it takes to put the shapes in - surprisingly hard when you are under pressure. But for those with a cool head and the right strategy, it is possible to do it in 14 seconds! Bring a bag of apples - you won't need any more than eight apples from my experience - and see how many you can stack in a set amount of time. I did this last term and gave the kids 27 seconds (because there are 27 books in the New Testament...and they all know that fact now) so that it wouldn't drag out for too long. Record - five. You need ten plastic cups. The idea is to time how long it takes to stack them up - four at the bottom, then three, then two, then one - then put your hands on your head and then unstack them back into a pile of cups and yell "FINISHED!" It's pretty quick so the yelling at the end helps for time keeping. And kids think it is fun to yell in class. If you google CUP STACKING you will see some pretty amazing examples of this challenge. Mine is a very simplified version but they love it. A friend found this one for me. You have to ease the hand piece around the wire without letting the circle of the hand piece touch the wire. Some of these gadgets buzz or beep if the circle makes contact with the wire. This particular one laughs at you hysterically. Time how long it takes to get from end to the other - and you are disqualified if it laughs at you. Most don't get a time. The laughing seems to diffuse the frustration and disappointment. This doesn't work in a classroom because it is too small to be seen from the back. All classroom competitions need to be visible by all or else they fail monumentally. Take it from me. I know. But this is great to use with a smaller group. They get to find and assemble the animal (with or without a guide picture, depending on how tricky you want to make it) and you time how long it takes. I have two sets of these so sometimes I bring out both sets and run this challenge as a race rather than individually timing them - with evenly matched children and only with robust kids who can cope with the fact that one will win and one will lose. 1. I run one of these challenges in Scripture classes every week across a whole term - with a new challenge each term. Every child who wants to participate is timed. This takes a few weeks and their time is recorded on a chart. When everyone has had a go I choose some to have a second go to beat the class or their own personal record. Sometimes I choose children at random to have a go, sometimes a child who needs a boost and sometimes I choose someone as a reward for good class participation. At least one child will have a go of the current challenge at every lesson, week in and week out. 2. In Sunday School I run a challenge for a month at a time. Every week the kids can have a go to beat their own score or break the group's record. I run a monthly challenge two or three times a year - injecting one when things are getting a bit flat and need some pepping up. 3. Rather than running a challenge over a long period of time, these can be used as a one off - the one who gets the best time gets a prize. Or run along the lines of "a minute to win it" - if they do the challenge in a minute...or whatever time you set...they win the prize. Or run it as a "minute to win it" across the whole term if you have a good supply of prizes - that probably works better with younger children. 4. Respect the child who doesn't want to have a go. For a quiet few, they won't want to be exposed at the front of the group like this. And that is OK. These challenges have absolutely nothing to do with teaching kids about God. But here are ten quick reasons why I use them. 1. They are quick - they don't rob too much time from a lesson. 2. They inject some fun into the lesson. 3. Because they are fun it helps in building good relationships. 5. So the kids look forward to your lesson with them. 6. And that means you are well underway to winning the battle with discipline. 7. Which means more time to teach. 8. And more opportunity to be kind, to show love and to demonstrate warmth. 9. If done ever single week then it becomes a constant. It's a bit like when you hear the dulcet tones of the West Wing theme music (or insert your own favourite TV series) at the beginning of each episode and it excites and prepares your mind for what is coming next. Think Pavlov's dog. 10. That then helps the kids to transition quickly into your lesson - which means less wasted time. It is five or ten minutes time well spent - which means twenty or more good teaching minutes in a thirty minute class. Please know that not every lesson works perfectly for me. Far from it. My last lesson today would testify to that. But I have had a much better strike rate, particularly with school Scripture, since I started doing this. I don't know that I have ever really thought too hard about where the book of Job fits into the scheme of biblical things. I usually just get to Job, take a breath and dive in. It's there in the midst of the wisdom literature with a timeless message and it just IS. But when was Job knocking about the place? Well, I was not three days into the chronological read through of the Bible, eleven chapters of Genesis under my belt, and there I was being redirected to Job, just before Abraham enters stage left at chapter twelve. Interesting. Turns out there are at least a couple of theories as to the dating of Job. The theory that places him around the time of Abraham rests particularly on the fact that in chapter one, amidst Job's calamities, his camels were carried off by a raiding party from the Chaldeans (Job 1:17). Abraham was from Ur of the Chaldeans. And the area of Chaldea later became known as Babylonia - important around the time of the exile. So the suggestion is that Job was around the time when Chaldea was Chaldea, not Babylon. Another theory has Job around the time of the exile. He is mentioned in Ezekiel 14:12-14. The word of the Lord came to me: "Son of man, if a country sins against me by being unfaithful and I stretch out my hand against it to cut off its food supply and send famine upon it and kill its men and their animals, even if these three men - Noah, Daniel and Job - were in it, they could save only themselves by their righteousness," declares the Sovereign Lord. Curious that Job is mentioned last in that list – and so the question is, does the order have any significance? And it has been said that whoever wrote Job shows a great knowledge of distant lands and is therefore unlikely to have been around any time before Solomon. The bottom line is that we don't really know. There are a few clues - and they are just too few. But the folk who constructed the reading plan I am using had to put him somewhere, so on this occasion they opted for the association with Abraham rather than Ezekiel. And I'm glad they did because it made me sit up, pay attention and read Job with fresh eyes.